On Tuesday, at Sabo area of Ikorodu, a suburb of Lagos, the woman pictured above gave birth to baby girl inside a commercial bus. The woman, who reportedly boarded the bus at Ijede, could not alight at the Sabo Bus Stop, as other passengers did, making the bus driver and his conductor suspicious. An eyewitness said in the usual manner in Lagos, the conductor started yelling at the woman to get down from the bus, but she could not utter a word as she had fallen into labour. It was said that the conductor, seeing that the woman was in labour, raised the alarm. But those around took to their heels, thinking a fight had started between the conductor and miscreants. The eyewitness added that when the shout for help persisted, some officials of Lagos State Traffic Management Authority, LASTMA, and other sympathisers moved closer, only to discover that the woman was in labour. 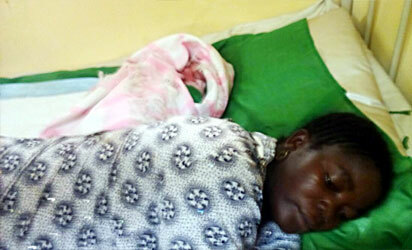 They rendered necessary assistance and the woman delivered a baby girl few minutes after. Both the woman and her newborn were taken to the Health Centre, Ita-Elewa for medical attention, while her personal effects were kept in the custody of one of the sympathisers. Fortunately for the woman, one of the good Samaritans was able to identify her and a message was sent to her husband, who also rushed to the scene. LASTMA officials and other sympathizers, who visited the health centre to catch a glimpse of the baby, were to said to have provided the items used for the deliveries. A volunteer Traffic Mayor, popularly called Baba Isale Eko, who was also at the scene, said the delivery was easier compared with that of some women.